Fans of superhero movies who don’t necessarily read the comic books that inspired them may be surprised to know that some of the most original, groundbreaking and successful properties that are around today aren’t published by Marvel or DC. To understand how this came about it’s necessary to go back to the start of the 1990s, when the industry dominance of the big two comic publishers was really challenged for the very first time. In 1992 a number of popular Marvel artists formed their own company, Image Comics, which would serve as a prominent example of creator-owned comics publishing. Propelled by star power and upset that they did not own the popular characters they created for Marvel, several illustrators, including the X-Men’s Jim Lee, The New Mutants/X-Force’s Rob Liefeld, and Spider-Man’s Todd McFarlane formed Image, an umbrella label under which several autonomous, creator-owned companies existed. Image properties, such as WildC.A.T.s, Gen¹³, Witchblade and especially McFarlane’s Spawn provided brisk competition for long-standing superheroes. Many popular creators followed Image’s lead and attempted to use their star power to launch their own series; ones for which they would have licensing rights and editorial control. DC’s Vertigo imprint, launched in 1993, was the company’s first successful attempt to routinely publish creator-owned series. In 1994, another industry giant Dark Horse (who publish a lot of film-related comics, such as Predator, Aliens and Star Wars, at least before Disney purchased Lucasfilm – but also have a number of original publications, most notably 300, Sin City and Hellboy) founded the Legend imprint in part to provide star creators like Frank Miller and John Byrne an avenue for creator-owned projects. By the mid-1990s Image became the third-largest comics publisher in North America, exceeded only by long-established industry leaders Marvel and DC. Image originally consisted of several studios, the most prominent of which was Todd McFarlane Productions, WildStorm Productions and Top Cow Productions, which initially functioned as if they were imprints of the same publisher (as Vertigo is to DC). Some of the founders’ studios came to resemble separate publishers, each with several ongoing series set in a shared universe (at first there were indications of an ‘Image Universe’ shared by all the studios, but these decreased as the studios developed their own directions). Image series such as Spawn and The Savage Dragon proved themselves as lasting successes (the former frequently topping the sales charts for months in which new issues came out), while new series such as Wildstorm’s Gen¹³, and Top Cow’s Witchblade and The Darkness were also successful. Perhaps the most well-known of all today, though, is Robert Kirkman’s The Walking Dead, thanks in no small part to a hit TV series, which allowed it to succeed in the one area in which Image Comics continues to lag behind Marvel and DC – screen adaptations. This is the part that really puzzles me because in many ways the output of Image Comics – a publisher known for its dynamic and extravagant artwork and character-driven plots – is well-suited to the big screen in particular. Top Cow especially has a shared universe ripe for adaptation that could be every bit as big as the Marvel Cinematic Universe. Witchblade, their biggest title, has already inspired a well-loved but short-lived noughties television series, an anime series and a video game. The series follows Sara Pezzini, a NYPD homicide detective who comes into possession of the Witchblade, a supernatural, sentient artifact in the form of a gauntlet which bonds with a female host and provides them with a variety of powers in order to fight supernatural evil. Sara struggles to hone the powers of the Witchblade and fend off those with a nefarious interest in it, such as entrepreneur Kenneth Irons and his bodyguard Ian Nottingham. It was revealed this year that Witchblade will end in October 2015, to coincide with its twentieth anniversary, so now is perhaps the ideal time to start reading the trade paperbacks of what is soon to be a complete series. 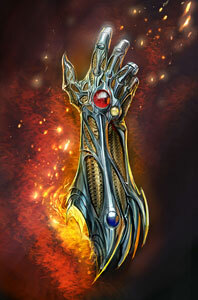 In addition, Witchblade acts as the gateway into the shared universe of the Thirteen Artifacts – 13 objects, each in the possession of a bearer (chosen like Sara was by the Witchblade), which together hold the key to the fate of the world. The Witchblade is the offspring of the objects known as the Darkness – wielded by the criminal Jackie Estacado – and the Angelus – held by Sara’s sometime rival Danielle Baptiste – and is meant to serve as the eternal balance between the dark and the light of the universe. Together they are the trinity and stand above all other artifacts. The Rapture transforms its bearer into a brimstone monster of immense power and grants the ability to release souls from the pit of hell – currently this is in the hands of the defrocked priest Tom Judge. The Spear of Destiny, rumoured to be the same that speared the side of Christ on the cross, has been wielded by an incarnation of the Magdalena for over two millennia – in each generation one daughter descended from the bloodline of Christ serves as the Catholic Church’s holy warrior against supernatural foes. The Glacier Stone can transform its bearer into an icy giant, and compels that bearer to prevent the gathering of the thirteen artifacts. The Ember Stone, in contrast, allows its owner to transform into a fiery dragon. The Ember and Glacier Stones are related to another artifact, known as Pandora’s Box, whose form is in constant upheaval. The other artifacts are the Blood Sword, the Wheel of Shadows, the Heartstone, the Coin of Solomon, and finally the Thirteenth Artifact. The Top Cow universe is rich and ripe for adaptation. Its characters are somewhere between the larger-than-life frothiness of those in the Marvel Cinematic Universe and the grittier, darker characters in that of DC. Most importantly, this is a new, different and quite refreshing take on adapting comic book stories for film, which the cinema-going audience is probably ready to experience after years of somewhat similar superhero movies. If something like Witchblade does ever make its big screen debut and, crucially, becomes a success, then there is no reason why publishers, imprints and studios and other than Top Cow should not get their turn. Who wouldn’t want to see a Spawn movie done well (allowing us to forget the disastrous nineties version)? Space is all the rage at the moment in the wake of Guardians of the Galaxy and with the upcoming Star Wars sequels, so why not adapt something like Saga? There’s plenty of shared comic book universes out there so come on film-makers, give them a chance!